Can anyone tame this wild planet? Bestselling author W. Michael Gear returns us to the planet Donovan—a world he laid out with such power in Outpost. Supervisor Kalico Aguila has bet everything on a fragile settlement far south of Port Authority but conditions couldn’t get any worse, as peril descends out of Donovan’s sky. Talina Perez gambles her life and reputation in a bid to atone for ruthlessly murdering a woman’s husband years ago. And Lieutenant Deb Spiro is losing it, and by killing a little girl’s pet alien, she may have precipitated disaster for all. 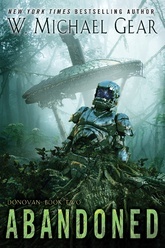 For everyone and everything on this treacherous planet, the struggle for survival sharpens as resources dwindle, technology fails, and the grim reality of life on Donovan unfolds.